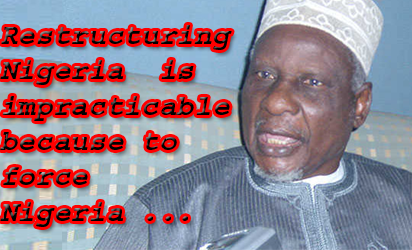 Alhaji Tanko Yakasai, Second Republic politician, in this encounter speaks on the military involvement in Nigeria elections and advocates that retired generals be excluded from contesting elections to position of civilian president where they also become commander-in-chief of the armed forces because of the negative impact of miliatry involvement in elections, especially the last elections. He pointed out that Buhari’s order to security operatives to shoot ballot box snatchers was in bad taste as it created the problems in Rivers and other states where elections were declared inconclusive. He bemoaned situations in Rivers, Kano and other Northern states where elections were declared inconclusive. He also expressed dismay at what happened in the North, especially in places where the PDP was winning and warned that if the issues are not handled properly, it could swallow Nigeria. WHAT do you think about military involvement in Nigerian elections? What we need to do is to make sure that we don’t invite them into democracy in Nigeria. The President, apart from his role as President of Nigeria, combines the job with that of the Commander-in-Chief of the armed forces. So, the military and other security agencies don’t see Buhari as a civilian despite being a civilian president. They see him as Commander-in-Chief and not as the President. So, to them, he is a soldier, a military man. Therefore, all his orders are being carried out whether it is constitutional or not. It is a big job to correct people when they go wrong and continue to make the same mistake. But if you remember, when Obasanjo was the president, he directed the military to act as if he was still a general. You remember the issue of Zaki Biam in Benue State and how troops overran Zaki-Biam under his watch. You also remember the issue of Odi. Then, Obasanjo used the military to exterminate Zaki-Biam and Odi. This is what is happening here. Buhari and Obasanjo are retired generals, but the military don’t see them as such. They still see them as Generals, and Buhari as a Commander-in-Chief. They don’t see him as a civilian and whatever he says is seen as a military order which must be carried out with fiat. Secondly, because of his military background, he does not see anything wrong with involving the military in a purely civilian issue. Nowhere in the world are soldiers involved in election matter as as we have in Nigeria. It is ridiculous to go out to elections, polling units and collation centres with guns in a civilian regime. It is not done anywhere in the world except in Nigeria and they are all over the place. They are in Kano, in Kaduna, Rivers, Bayelsa, Akwa-Ibom, everywhere. The pictures are published everywhere of soldiers wielding guns, blocking roads, operating at polling units and collation centres in a civilian election. I saw in a collation centre in Rivers where the military were beating an electoral official. That is not right and it is a problem. In future, even in re-run elections, the military should be far away from civilian events like an election. We should stop militarising elections and the military should have their place where they belong. They have no business with Nigerian election or using guns to intimidate voters and electoral officials. It has never happened elsewhere in the world except Nigeria and should not be tolerated. The President was wrong in acting with military fiat during an election, giving the military such an order and knowing they will obey same to the letter. This thing the military is doing is destroying our democracy. So, they shouldn’t be involved in elections? They should not and we should not be quiet about it because if we don’t speak out, they will do worse things when they come out in their true colours. It is the duty of the media and we the Nigeria people to talk about this and expose the dangers inherent in the militarisation of democracy. We should speak out before things get out of control. Nigerians should be aware of the danger involved in having them control our elections. When they are retired, we can elect them as Senators, Governors and House of Representatives members.A retired general should no longer be the president of Nigeria. I am advocating that Nigeria should not elect a retired general into the position of a Commander-in-Chief. A retired general who will combine his job with that of a Commander-in-Chief of the armed forces is bad as President of Nigeria. I will ask that the law of the land be amended to hinder retired generals from contesting elections as the President of Nigeria. Is that what brought about inconclusive elections in some states? We have never had the issue of inconclusive elections except in the tenure of the current INEC leadership. Before this election, the leadership of INEC was held in very high regard and people expected credibility and integrity in their handling of the elections. But when we started hearing inconclusive elections, people started to doubt the integrity and competence of the leadership of INEC. Now, we have seven inconclusive elections in the current elections. The irony of it is that it happened in the Northern parts of the country and also in states where the opposition is leading. We cannot accept this. President Buhari said he wants to be remembered for conducting the most credible elections in Nigeria. That has failed already. The inconclusive elections in the country is nothing to write home about, especially when talking about the integrity of the current elections in Nigeria and the electoral commission. It has never happened in Nigeria or anywhere in the world. It is seen as a real device to rig elections. Anybody that is knowledgeable about the conduct of elections can pre-empt this very bad way of running elections. It happened in seven states in this election. Only God know what will happen in subsequent elections. So, Nigerians must rise and kick against this threat and we must make sure that the integrity of elections is protected, otherwise, without credible elections, there will be no credible government and if there is no credible governments, there will be no development. It seems the case of Rivers is worse than elsewhere, as if the military are now the election umpire. It is terrible and has never happened. The election commission should start putting its acts together. We know that in Rivers State, there is no love lost between Rotimi Amaechi and Nyesom Wike. And now, an election was conducted. In almost about 90% of the state, everything was fine but when they found out Wike is winning, there was a collusion between the army, the police, the INEC to stop the result of the election. A number of things is at stake in Rivers State and the powers that be should know this. It has not happened before and has never happened anywhere. Wike from the results announced by INEC so far clearly won. But Amaechi could not take it. He is the one causing the problems in Rivers. How can one individual cause mayhem in his own state? INEC has set up a fact-finding committee and they should allow INEC to announce the results. APC has no candidate in Rivers election and two days before the election, Amaechi adopted an unknown person as his candidate and he is causing problems in Rivers. Everybody knows the candidate Amaechi adopted could not have won. Nobody knows his name until now. Amaechi wants to govern Rivers by proxy and it is not acceptable. It cannot happen and Nigerians should speak up now against the impending disaster in Rivers because it can swallow the whole country. We should learn from history. I know some people don’t care about legality and how power is taken but we should care. If this is democracy, we should act as democrats. Democracy has the same meaning in Nigeria and anywhere else. It is a tool for development and if we don’t have democracy in Nigeria, there will be no development. This country is suffering. We were on the same level with countries like Korea, Brazil, Indonesia, Malaysia and so on. Now, because of lack of democracy in Nigeria, these other countries are far ahead. Let Nigerian people redeem democracy. We should stop people trying to take power by force for their own selfish reasons. Nigerians should fight this hopelessness happening in our democracy. INEC should sit up and do the right thing because history will judge the commission if anything happens to Nigeria.